GrabCar, the private hire vehicle booking service available through the GrabTaxi app, is the first and only service of its kind in the Philippines to be fully accredited as a Transportation Network Company (TNC) by the Land Transportation Franchising & Regulatory Board (LTFRB) . Natasha Bautista, Head of GrabCar Philippines, said this GrabCar accreditation validates the company’s efforts in providing the safest and most convenient rides for passengers in the Philippines. “With full accreditation, more Filipino commuters will be able to use GrabCar and be confident that we offer a legitimate and safe private hire service. We will now focus on rapidly expanding our GrabCar service to serve more passengers across the Philippines,” said Bautista. GrabCar develops game-changing regulations that champion innovation and public safety for society. When GrabCar first entered the market, the service operated on par with the current industry standards. In May 2015, the Department of Transportation and Communications (DOTC) announced that it would create a new classification to accommodate mobile app-based booking services. On July 3rd, GrabCar became the first company to complete all the requirements and receive full accreditation as a TNC. The requirements for TNC accreditation include: business permit, certificate of registration duly issued by the Bureau of Internal Revenue (BIR), business model proposal with proposed fare rates and service charges, and complaint mechanism against vehicle owners and drivers. “The stringent safety and training process we’ve implemented since day one has ensured that GrabCar complies with the new TNC regulations seamlessly and can be the first to be fully accredited by LTFRB. We are committed to screening and training our GrabPeer drivers for GrabCar in full compliance with the TNVS accreditation requirements set by LTFRB. In fact, we’re working with our Regional Head of Safety and the LTFRB to consistently ensure that our screening and safety measures are of the highest standard possible,” said Bautista. “GrabCar has been very collaborative. Since day one of operations, they have been working closely with us to ensure that the policy on TNCs prioritizes passenger safety. 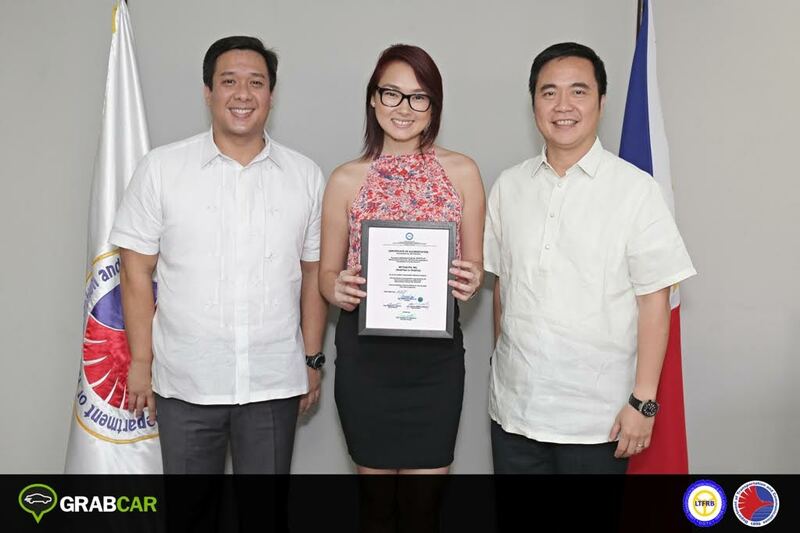 We are happy to announce that GrabCar has already been accredited upon meeting all government requirements, and we are positive that this will revolutionize the Philippine transportation industry," said Roberto Cabrera, LTFRB Executive Director. GrabCar aims to complement the current transportation options in the country and provide passengers with another safe and affordable ride option. GrabCar believes that with full accreditation by the Philippine government, TNCs will be able to provide a fast, safe and convenient transport option for passengers. To celebrate its full accreditation by the Philippine government, GrabCar is giving away an unlimited P100 discount on all GrabCar and GrabCar+ rides! Just use the promo code LEGALLYGRAB on every booking from July 7 to July 21, 2015.